Just traded some items for a 3 spd 1969 folding bike. The head badge has the crossed rifles on it and the bike is painted green, with gold lettering that reads "Twenty". Anyone know what the collectability for these bikes might be? And where I can get a set of new tubes? I recently came across a pair of whitewall tires, obviously for an English bike. Turns out they were 27 inchers, although I forgot whether they are 27" & 11/4" or 27" & 1 1/4". It has a modest tread pattern, looks similar to the tread used on the late 1970's Raleigh Sports. I realize that, regardless which size it is, these tires don't usually pop up in whitewall, so I thought I'd let you folks know about them. I think the brand is Duro. I'll be heading back to that bike shop sometime soon, so if anyone might be interested in them, give me a holler, and I'll make sure to check the size the next time I go. I have a prewar Swedish roadster with a one piece crankset. It does Not have the bottom bracket ith the nut instead it has an inner nut with a couple of pin holes and an outer sleeve. What is the process to remove this bottom bracket? An old bike Ipicked up awhile ago had a simular 1 BB..it was a 3 piece, but it had the nut with the 3 holes as you described..a few taps with a pin punch and a hammer should break it loose and then it should be fairly loose...use some oil on the threads and it should unscrew easily (mine did and the bike over all was pretty weathered and rusty. Im not sure but it also may be a backwards thread...take a close look beofre you do any damage and see if its loosening or tightening after a few taps! Does anybody know of a supplier for 28" wheelsets? I'm looking for a 26 x1 3/8 Dunlop EA3 Rim to replace the rather rusty and unrestorable one on my Sunbeam. Does anybody have one they might want to sell? Thanks! The EA3 is an Endrick. Thanks! I am delighted to annouce that the frame of the 1974/5/6 (take your pick) Raleigh has finally been completed. The decals and clearcoat were applied last week, and I mounted the crank and other parts a couple days ago. P.S. : For those who are curious, the decals I ultimately used are original N.O.S. Raleigh and Rampar decals from [url]www.mostlymusclebikes.com[/url]. A great place for N.O.S. Raleigh parts, including N.O.S. 26" and 28" Raleigh fenders, Raleigh Chopper parts, and other items of interest. Has anyone replaced a lubricating cap on an S-A hub? Mine was fine until today, but now keeps popping open. I have it plugged temporarily with the help of a piece of plastic from a shopping bag. Do you just yank the old one off and screw in a new one? Any insights will be appreciated. For you film buffs, do try and rent (Netflix has it on dvd) the British movie "Saturday Night and Sunday Morning", 1961, starring a very young Albert Finney. This is shot entirely in location (gorgeous cinamatography in b/w) in Nottingham including the Raleigh works where Finnet's character works! Lots of interior shots including Finney turning bottom bracket axles on a lathe.. 955 a day! There are also cycle shots galore. Of course Finney, an angry Bolshie kinda of a chap, doesn't ride a Raleigh... he appears to have a rather nice Holdsworth or similar with four-speed Cyclo-Benelux derailleur, cream mudguards.. the works! An excellent if somewhat depressing film with loads of cycle interest! Sounds intrigueging, to say the least. I just checked out a link provided (on the Vintage Lightweights area) to a vintage Swedish bike site. There are some terrific ones on it - note especially the wonderful chain and skirt guards on the ladies' models! I am very new to the bike collecting world. I was actually introduced this morning when my husbands grandmother gave us a bike she couldn't ride any longer. I believe it is a collectable but need more information. I'm having trouble finding anything.I would appreciate any help. What I can tell you is it's a Wearwell brand ladies bike. Possibly a commemorative edition because it has a small painted badge on the seat tube referring to 1954 Daily Express Tour of Britian 1st place Ian Greenfield etc. I also has the word Tourist on the top tube.I believe it has a 20" frame with 26" wheels, Kenda tires. Green enamel paint with gold piping. Has a Brooks black leather saddle. The Schwinn handles look to me not to be original. Cable brakes. Shimano gears(also probably not original) with the shift mounted on the down tube. I'm so new to this I can only give a guess that it's a 5 speed(probably newer)The hubs and rims only say Made in England. Has Weinmann brakes type 730. The only stamp I can find on the bike is located on the drop out labled F4163. Try this site. http://www.localhistory.scit.wlv.ac.uk/Museum/Transport/bicycles/wearwell4/Wearwell4.htm, You should find all you need about Wearwell Bicycles here. I have up on ebay right now a full rod brake system including handlebars from an old Raleigh Roadster. It was a 28 inch wheel bike and these brakes are in nice shape. Have a look. Chris's post, "Wanting It New" was the best description of the whole collecting addiction I've ever read. If there was a bible for bike collecting, that ought to be chapter one. Thanks, Chris. An example is the Brampton 3 speed hub up on e- bay. Oh I'd love to have that hub! Threaded driver, thoes old style cones and that MINT shifter. Oh but it's too high for me at $42. or whatever it is. I have had some restoration work that went off course, and that kinda puts a damper on this. You regret trying and you just resolve to look for a mint example. I've been romanced by the old catalogs and literature and after wanting this or that and then you finally find that steel rear cycle rack and the leather bags that go on it and here it is rusted and needing a re- finish it bums you out. To replicate the finish on something you had stripped and having it come out wrong or looking atrifically new is also a bummer. So all in all yes, I'd like it to be in mint shape. Besides it's not too often that the mint bike is offered for sale at all. They don't ask some outrageous price that I pay like a fool just to get it over with. No, in reality it's not for sale and you see it and go home without it. Or you just hear about it and they never let you see it. Or it's just a picture. Part of the secret of this is knowing what to hold onto and keep and not let go of. I am enjoying a clutter free garage and basement a bit too much lately. Sometimes the bike bug need to re- bite you again. sam, I should hook you up with my friend Morgan, who recently retired to Texas. He ran the LBS here for many years. He took his Rene Herse, his old Paramount, a prewar Schwinn lightweight, and a couple of lovely roadsters with him, but he left behind (in my basement, now) quite an assortment of things none of us would throw away, but it took a good eye to know why... Chris, reading these posts regularly we get to know each other, and see who (like me) can't pass a frame leaning on a garbage can without stopping to check. But at heart it's that shiny chrome part still wrapped in grease paper that keeps us dreaming. Does anyone know a supplier for reproduction string skirt guards? Old illustrations show some very elaborate designs, with patterns, colors, etc. I hate to just use plain string on an attractive bike. Thanks! PS-I also posted this in the vintage section--I hope no one minds. I spent ages looking for a source for these. I tried Holland and the Netherllands with no sucess. They may be out there but where?. In the end I got a book on Macrame from the local library and made a pair. It was suprisingly easy. I just modified a pattern for a string bag. I used Italian braided cotton as recommended in the book. Give it a try. It could be a good project for the winter evenings. I don't have the link at hand but the brazillian guy with the large vintage bicycle webpage (mostly german stuff) - who posted here asking for info on his triumph - sells string skirt guards as well as various old and repro bits for old german bikes and some NOS british parts. http://www.bicicletasantigas.com.br/ click on compra e venda, then "vendem pecas de bicicletas aintigas" then acessorios e diversos. I talked to the guy before about getting an old german bike, he is willing to ship to the US. ..........And while you're at it, you must check out the Kroon Vansbroo under >Galeria< then >Bicicletas Suecas< then >kroon Vansbroo< This 1948 bicycle from Sweden? is truly stunning and nothing you have ever seen before. The price was $2800. Welcome back, Wes! Good to hear from you again. I still have the 60's Raleigh Royale. I was tickled to hear from someone who has one with nearly the same specs, in New Zealand. I have just returned from the Beaulieu Autojumble, in the New Forest, England. This is my third visit to buy old British car parts for my business, but I am always impressed by the bikes and parts available there. This year was no exception. The one I didn't buy (but wish I had) was a 1950-ish blue Lenton, 531 frame, alloy FM hub, original and beautiful, for about $325. Another similar machine was a Humber (I forget the model) club bike, same hub and tubing, dark reddish brown, but less of a deal at $550. It didn't sell but I think the Lenton did. 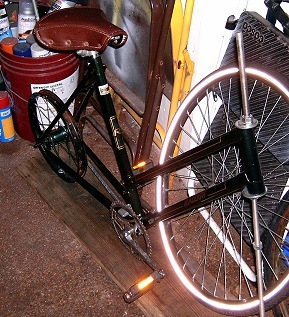 I did buy a club bike, though: for $35, I picked up a 1940s Dawes lady's machine, light, interesting dropped bars (not much drop but they are not inverted North Road bars), Cyclo 3-speed derailleur, EA1 Endrick rims, Bluemels mudguards (baby blue,though). It's original except for cheap pedals and saddle, with flattish black paint that I think will shine up some. The only decals are "DAWES" on the down tubes. Everywhere I looked were roadsters, mostly rough, brush-painted black ones with blown tires, all cheap. One guy had a pile of four or five bikes, two Raleighs, a Rudge, a Robin Hood and a Sunbeam, with assorted rims and other parts, with a sign that read "20 pounds for the pile o' bikes". I bought the Dyno DBU from the pile for a pound, and the guy insisted on my taking the Raleigh Sports frame, with gearcase, it was attached to. I am shipping that home with the Dawes, for some reason. I also bought a Dyno-Four rear wheel with stainless rim, which I need for my 1950 Superbe. It's really a mecca for this old stuff, and most of it is cheap. One guy had NOS gearcases for 10 pounds. I bought a Raleigh one from him. There were dozens of old pumps, Dyno lamps, wheels (I found some grubby NOS Westwood rims and bough them), everything you could think of for old bikes. I bought several Michelin tires, because I don't care for the Taiwanese ones available here, and even found one NOS Dunlop. Another find was a set of Marsh track bars for my prewar Raleigh Record Ace, with the proper undrilled stem, for very reasonable money. I had been searching for these for some time. I saw at least half a dozen tandems, all pre-1960. One had a gasoline engine. Many old roadsters had similar gasoline engines, including one type which fits inside the rear wheel. Most had not run for years, but a couple looked serviceable. There were also many old motorcycles, some of which are pretty much just bicycles with motors. Cool stuff! Some year, maybe I'll buy one of those old bicycles with a motor, just because they are so bizarre. It was a terrific experience, and I am looking forward to next year's trip. Sorry about this long post, but I thought some of you might enjoy reading about how they do it over there. Thanks for sharing the experience Geoff! I will say... it required no less than THREE drooling towels reading through it all! many moons ago I posted a message telling you folks that we still throw away cycles which on the your side of the pond would be collected. My interest in RSW's and Moulton's is considerd a bit strange by some. The purists wouldn't give a roadster shed room, but me; I love 'em. It is a crying shame that good bike sform the 40's to the 70's are being chucked into skips (dumpsters) with the rubbish (trash). You can still buy most post-TI roadsters for under �20, at car boot sales, garage sales or charity (thrift or Deadman's) shops. My supreme only cost �10 last year. There are plenty of septagarians trundling about on roadsters too. It isn't quite cycltopia, but nearly. In Gt.Yarmouth, Norfolk, England there are plenty of trade bikes (cycle trucks) still in use, maybe only to roll down to the allotment or to market. I've even seen a special very low gravity model in use. This was built for the carriage of herring boxes from the dock to a fishmongers & now just carries its owner and odds / ends into town. In short there is an active roadster scene over here, between the preservationists and the original owners. Students seem to like the roadster image too. You may be interested in an upcoming auction by Cheffins ( www.cheffins.co.uk ) Of the contents of and amusment park at Fleggburgh, Norfolk. Check out the invalid carriages! Enjoy what you ride and ride what you enjoy. I read the posts here often and will always help if I can.